We've tapped some very special guest bloggers to help us celebrate this summer's Word for Word Poetry series at Bryant Park. They'll provide a behind-the-scenes look at each event and divulge about the talented poets who share their work. 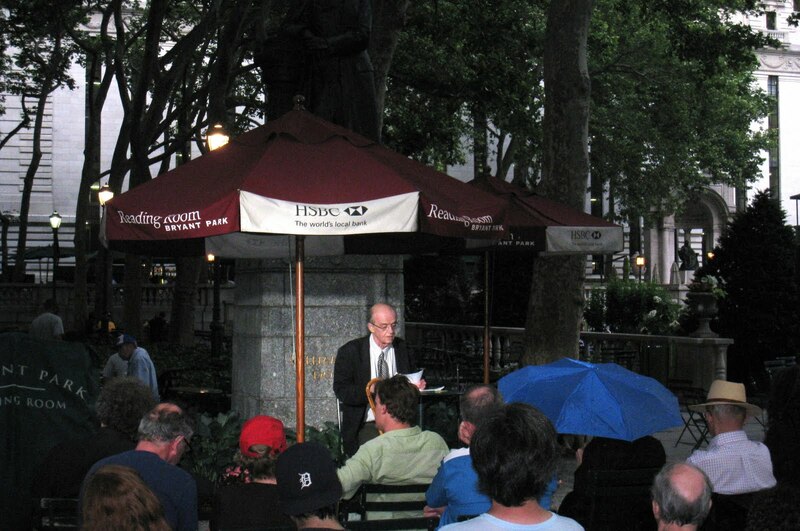 Experience Word for Word Poetry yourself every Tuesday through September 14, from 7pm to 8:30pm, at the Bryant Park Reading Room. Hello to all you readers out there. I'm Mary Austin Speaker and I'll be blogging for the Word for Word series for the month of June. You can find my bio below. Tuesday's first reading of June was a great, if tentative, success. The clouds threatened, but Paul Romero, Director of Tourism & Visitor Services at Bryant Park and general Pusher of Poetry, decided to chance it and hold the reading outside even though stormclouds hovered. It was the right call. Being outdoors for a reading is a remarkable experience— the practice of public reading is one that many people never see and it's wonderful to watch the looks on people's faces as they walk by and wonder what it is we're doing. And it's not every day you get to listen to both birds and poetry at once. Joan Larkin introduced Marilyn Hacker, tracing the powerful effect of her work on the women's and LGBT movements back to the 1960s. Marilyn Hacker is a fantastic reader of poetry— she revels in reading—eyes fluttering closed, face upturned, clearly taking her pleasure, and you can sense that taking her pleasure has been one of her life's primary concerns. She is an explorer, a translator, a seeker of new experiences. When we caught up she told me she'd just returned from Damascus where she's been taking Arabic classes in an effort to diversify her already considerable translating capabilities (she's one of contemporary poetry's best translators of French), and hopes to return "ASAP." True to form, as it were, Marilyn read a number of formal pieces (she's known as one of our most consistently formal poets), among them a glose, a Spanish form in which the speaker initiates the poem with four lines of another poet's work, and ends the poem with a "tail" consisting of four stanzas, each of which ends in one of the initial four lines. Marilyn chose a poem by Claire Malroux (whose work she has translated) to "glose," demonstrating the extraordinary cross-pollination her later work has begun to exhibit. Her reading ended with a moving tribute to June Jordan, another poet who dedicated much of her life to activism, as Marilyn has— "June, you should be living / The States are bleeding." This on the eve of the Israeli Army's attack of a vessel full of activists heading toward Gaza to distribute aid. It was the perfect note to end on. Cyrus Cassells introduced Paul Muldoon, the esteemed poetry editor of the New Yorker and winner of all manner of prizes including the Pulitzer, and offered a quote from Richard Sanger to sum up the singular effects of Paul's poetry: "No other poet is as wicked, as stylish or as fun." Mr. Muldoon's reading was typically musical, lulling the crowd with his playful poems that often hung on a note of sadness but carried through with wit and language play, rhyming "Spanish" with "vanish," "cabinet" with "rabbit," "pig" with "fig," "Fanta" with "Atlanta," "mobster" with "lobster," cheekily ruffling the feathers of the wealthy by pulling their ornaments into rhymed verse (see "Pucci" / "Gucci"). 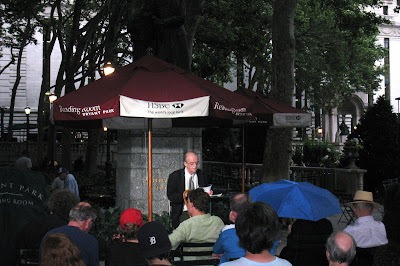 Paul also read a number of traditional forms and finished up his reading when a few raindrops began to make their way to the stage in a burst of enthusiasm for the next poet, James Tate, who was making a rare appearance in New York. I introduced James Tate, or half-introduced him, so concerned I was not to take up all remaining non-raining time, but I did manage to lay out my argument that James Tate is a poet of bewilderment, who engenders in us, with his perplexing narratives, a heightened sense of awareness usually available only to the highly disoriented. And a poet who has strategically created so many awkward displays of patently inappropriate behavior in his poetry that he has left us with an understanding of normalcy as a series of very narrow choices. A few sirens went by. The crowd bore with me, and cheered as James Tate took the stage and read his peculiar, magical poems, fables of the everyday, narratives where ethics are turned askew enough for us to experience them afresh. Offhand murder vs. lying about offhand murder. The appropriateness of having an ostrich for a grandmother. A case of mistaken identity involving questionable animal ownership and invisible alligators. The niceties of interactions between strangers being utterly ignored. One poem described the pedestrian nature of the post-apocalyptic moment: "we roamed the streets like zombies / gathering scraps for our babies and old people." Lines being crossed everywhere in ways that seem unfathomable, hilarious, uncomfortable and wonderfully strange. It was great to see him read. Hats off to Marilyn, Paul and James for a fantastic reading. I'd risk rain for them any day of the week. See you next Tuesday (June 8, at 7pm)! Mary Austin Speaker (www.maryaustinspeaker.com) is the author of the recent chapbook, Abandoning the Firmament, (Menagerie Editions 2009). She is co-curator and founder of Triptych Readings (www.triptychreadings.com) in NYC, poet laureate of F.E.A.S.T. (www.feastinbklyn.org), and works as an art director for Ecco, an imprint of HarperCollins Publishers. Her poems can be found in recent or upcoming issues of Iowa Review, Boston Review, Gray Tape, H_NGM_N, New Orleans Review, and elsewhere. In previous iterations, she was poetry editor of Indiana Review, co-curator of Readings Between A&B, and taught creative writing at Indiana University. She loves westerns and astronaut paraphernalia.